Kelly Boudreau’s life changed forever at the age of six. She was hanging out with a friend and they decided to go to his house. Bored, and with nothing to do, Kelly and her friend thought it’d be a nice gesture to rake his parents’ entire back yard. After they finished, they put the leaves in a hole that his parents normally burned them in and lit a match. The damp leaves wouldn’t catch on fire. Kelly’s friend then went to his barn and grabbed a can of gasoline that he poured in the hole and lit a match. Although he knew to step back, Kelly had no idea what her friend was doing. Kelly was still hunched over the hole when the fire blew up in her face. Kelly didn’t know what to do except to roll on the ground to get the fire out and then ran to her house, which was a couple blocks away. Kelly’s mother was the first to see her and immediately ran water over Kelly’s face before rushing her to the hospital. Because of the severity of her burns, Kelly was taken by ambulance from her hometown, New Glasgow, NS, to a larger hospital in the city of Halifax. During her two-month hospital stay, Kelly was in the Intensive Care Unit and then placed in the burn unit. While she was recovering, Kelly’s parents took turns sleeping in the hospital room with her. 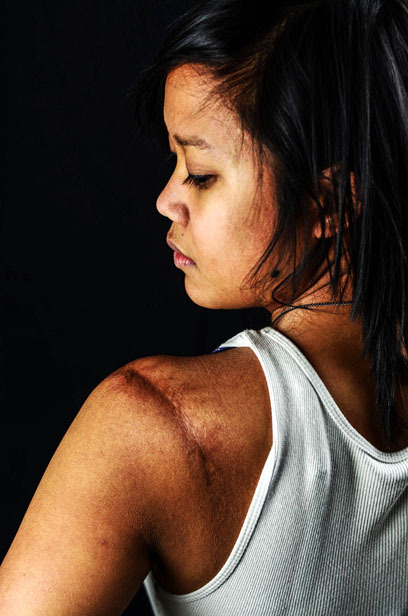 Although she was young when she had her burn injury, Kelly remembers walking the hallways of the burn unit with her family and the struggles she had to look in the mirror for the first time after her accident. She also will never forget the extremely uncomfortable hydrotherapy baths – a particular type of occupational/physical therapy that uses water to for pain relief and treatment – she had to take where nurses and medical staff had to use tweezers to remove the dead skin from her face. Kelly was released from hospital around the same time as her elementary school’s Christmas concert. Kelly’s teachers and parents were concerned about her being a part of it because they were worried about other people staring at her. But Kelly was set on participating. And though people did end up staring, this didn’t stop Kelly from singing. Other peoples’ support also helped Kelly keep a positive attitude. This included an occupational therapist, who spoke to the other children at her school and explained why Kelly looked the way she did and why she needed to wear a pressure garment mask – a facial mask used to help reduce scarring from burns by keeping the tissue flat and smooth during the healing process. But as she got older, Kelly was bullied, particularly during her pre-teen and early teenager years. It was through this experience that Kelly realized who her true friends were and what a true friend meant. Sports played a huge role in Kelly’s life and allowed her to escape when life was tough. Whether it was on the soccer field, lacrosse field or in the rink, Kelly felt like she was being judged on her talents and not her burns. This gave her a sense of confidence. Her family also played a huge role in helping her overcome the tough times. Kelly was familiar with burn support services, but wasn’t entirely comfortable seeing people with burns at such a young age. However as she got older, she started wanting to explore this side of her life. In 2005, she thought of creating a Facebook group called Burn Victims Survivors that connected burn survivors from all over the world. Kelly was hesitant because she didn’t know if creating a group would really create any interest, but she was encouraged by people in her life to do it. To her surprise, the group then started growing at a rapid rate and the posts became daily. The group has connected people all over the world and has become a safe and welcoming space for anyone who has been affected by burns. It provides group members with place to share stories, pictures, ask questions, find guidance, gain insight, etc. To date, there are over 1400 members in the Facebook group. Attending a burn camp – a retreat for burn survivors to get together – in Nova Scotia inspired Kelly to become a burn survivors camp counselor. Going to the World Burn Congress, an international burn survivors conference, also taught Kelly that every burn survivor’s experience is different. Kelly’s interest in giving back to the burn community continued when she became a teacher. Teaching enables her to educate students on the importance of fire safety, while providing them with a positive role model. Kelly’s accident also made her realize how important family is to her, and to this day her mother is one of her best friends. Being a burn survivor has also given Kelly an appreciation for life and has encouraged her to not judge others. Kelly has come to realize that almost everyone will undergo some sort of pain or trauma in their life that changes them for the rest of their lives, but she believes the most important thing is to not let that experience define who you are. Since graduating from university in Nova Scotia with a Bachelor of Arts and Bachelor of Education degree, Kelly has moved to Sandy Bay, SK where she works as an elementary school teacher. Brings tears of joy to my eyes…you are an amazing young woman Kelly! I am so blessed to call you my friend! Kelly, you are such a strong, young lady with an amazing personality. It has always been my opinion that a person’s beauty is on the inside. The most beautiful looking woman in this world could never be as strong, courageous, kind and caring as you are! I remember meeting you at your Nanny’s and was instantly drawn to your beauty! It’s sad that you were bullied but it’s great that you are who you are today! I hope life treats you kind and that you experience lots of happy times! You do have an amazing family and you make them proud! Hugs to you!